Dried fig, skin and pulp of green fig, and commercial extract of fig (Gandolfo et al. 2001) . Skin and pulp of figs and fig extracts (Antico et al. 2003) . Extracts were prepared by separating the skin from the pulp and extracting them separately with PBS (1:4, w:v) for 15 min at 4°C. After centrifugation at 12 ooo g for 15 min at 4°C, the supernatants were collected and stored at -20°C. Prick-to-prick method. Reactions were judged as ++ if the weal diameter exceeded 3 mm, and as +++ if equivalent to or greater than the positive control (histamine dihydrochloride 10 mg/mL). Weals between 2 and 3 mm with surrounding erythema were classified as weakly positive (+) (Focke et al. 2003). Prick to prick. Wheals greater than 3 mm were classified as positive (Caiaffa et al. 2003). A 35-year-old woman who immediately after eating a dried fig, presented palatine pruritus, sneezing, nasal obstruction, hydrorrhea, sore throat, sibilant dysnea, cough, and bilateral palpebral angioedema (Gandolfo et al. 2001) . Five patients reporting adverse reactions after the ingestion of figs. A sixth patient, who never ever ate figs, was included because she reported respiratory symptoms from contact with ornamental FB (Ficus benjamina) trees (Focke et al. 2003). Skin prick test was positive for both fig and Ficus benjamina (FB) (Mock et al. 1998). Skin prick tests were positive with dried fig, skin and pulp of green fig, leaf and latex of F. benjamina (prick-prick), and commercial extract of fig (prick); they were negative with kiwi, banana, hops, chestnut, Hevea brasiliensis latex, common environmental pneumoallergens (prick), and Ficus lyrata (prick-prick) (Gandolfo et al. 2001) . A 35-year-old woman (Gandolfo et al. 2001) . RAST to fig fruit was positive in all patients (1.68/4.98/1.39 kU/l) as was RAST to Ficus sp. (CAP K81) (5.31/60.8/1.22 kU/l). All patients were also sensitized to pollen allergens (Hemmer et al. 1999). Specific IgE to fig was 4.2 kU/l and to H. brasiliensis latex, <0.35 kU/l (Gandolfo et al. 2001) . No IgE to fig was detected for any of the patients (Antico et al. 2003). IgE immunoblotting showed recognition of a major band of 20 kDa by one patient and three bands of 10, 22 and 24kDa by the other patient. Proteins were separated by SDS-PAGE according to Laemmli et al. 1970. (Gandolfo et al. 2001) . SDS-PAGE was carried out using 12% homogeneous gels (10.5 × 8.0 × 0.1 cm) with 5% stacking gels. The resuspended lyophilized proteins (15 µg protein/lane) were mixed 3 : 1 with sample buffer (tris buffer containing 0.1% SDS) and, prior to SDS-PAGE, were (1) either denatured and reduced by boiling in the presence of mercaptoethanol (95 °C, 5 min), or (2) reduced with 0.22 mol dithiothreitol (DTT) (37 °C, 30 min) and subsequent incubation with 0.5 mol iodoacetamide for 10 min to alkylate reduced disulphide bonds, or 3) separated by electrophoresis without any denaturation and reduction steps (Focke et al. 2003). Proteins were transferred onto PVF membranes and the membrane incubated with patient sera (1:3). IgE antibody detection was performed with anti-human IgE peroxidase-conjugated antibody and blots were revealed by chemiluminescence (Antico et al. 2003). Electrophoretically separated proteins were blotted to nitrocellulose. After transfer, sheets were cut into strips of 3 mm and blocked with bovine serum albumin (BSA)-containing buffer (50 mmol/L sodium phosphate, 0.5% (v/v) Tween 20, 0.5% (w/v) BSA, and 0.05% (w/v) sodium azide, giving a final pH of 7.5) for 30 min. Each strip was incubated overnight with 1 mL of serum (diluted either 1 : 10 or 1 : 4) at 4 °C under continuous shaking, washed twice in buffer for 30 min and incubated overnight at room temperature with 125I-labelled rabbit anti-human IgE (Focke et al. 2003). A major band of 20 kda plus a minor band with a lower molecular weight were recognised in the skin extract by patient no. 1, while 3 bands (10,22 and 24 kda) weere detected by patient no. 2. No IgE-binding bands were found in PBS-soluble fraction of of the fig pulp. However, 2 bands were recognised by patient no. 1 in the PBS-insoluble fraction of the pulp (Antico et al. 2002). The extract contained two allergens of 19 and 35 kda recognised by the patient (Gandolfo et al. 2001) . Only two patients were positive in the fig fruit blots. Patient 3 reacted moderately with a protein smear between 40 and 100 kDa and a 20 kDa band. Patient 6 reacted with allergens between 30 and 100 kDa, with two poorly delineated bands near 45 and 55 kDa. RAST to FB (Ficus benjamina) was inhibited >95% by FB extracts and 16-65% (mean 49%) by extracts from fresh fig. RAST to fig fruit was inhibited >95% by FB and fresh fig, 63-97% (mean 86%) by dried fig, and 0-84% (mean 35.5%) by kiwi fruit (Focke et al. 2003). Cross-reactivity between fig (Ficus carica), weeping fig (F. benjamina) and natural rubber latex was confirmed by RAST inhibition (Brehler et al 1998). Gandolfo et al. (2001)  and Focke et al. 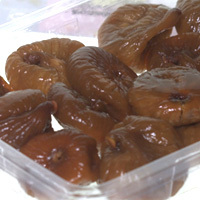 2003 concluded that Allergic reactions to fresh or dried figs can present as a consequence of primary sensitization to airborne Ficus benjamina allergens independent of sensitization to rubber latex allergens. Kiwi fruit, papaya, and avocado as well as pineapple and banana may be other fruits associated with sensitization to Ficus allergens. Allergy to Fig (Ficus carica). Cross-reactivity between Ficus benjamina (weeping fig) and natural rubber latex. Antico A, Zoccatelli G, Marcotulli C, Curioni A.
Focke M, Hemmer W, Wohrl S, Gotz M, Jarisch R.
Cross-reactivity between Ficus benjamina latex and fig fruit in patients with clinical fig allergy.